We’ve entered a Brave New World of Smartphone Applications, and this technological boom doesn't seem to be abating anytime soon. In fact, the new frontier of mobile computing only seems to be gathering more and more steam every day. How close are we to Stanley Kubrick’s vision of the HAL 9000? What once seemed like light years in the future might only be a few clicks away. One thing is for sure, as far as tech numbers and gadgets are concerned, we’re a long way from the Atari 2600. Technology is filled with all sorts of conundrums. Just because software engineers and computer Einstein’s can create what seems like an endless conveyor belt of new technologies, does it really mean we need them all? Sure, these are philosophical questions, but they are also questions that affect your everyday life, too. Who gets to differentiate between a frivolous and time wasting app and one that makes life easier and more convenient? In this day in age, people who rage against technology and computer software are viewed as some type of Ted Kacznski, Back to the Land fanatic. Whether they like it or not, however, phone apps are here to stay, and they are only getting more advanced. So in this post we are going to thoroughly Review Of Verizon FIOS Mobile Apps - Mobile Remote App, FIOS On Demand App & FIOS DVR Manager App. Verizon is a broadband and telecommunications company that is familiar to most everybody, so let’s use their technology as an example. Here are the benefits and perks (reflections and asides, too) of three of their popular mobile applications. Verizon’s motto for its apps is the following: “You’re on the go. And now so is your media.” This already begs the question: If we weren't so busy and stretched for time, would such things even be necessary? Verizon Mobile Remote does exactly what its name suggests. It turns your phone into a remote control for your TV. The app gives you the power to control HD Set-Top R4xes in your home, so whether you have a TV in the living room or the bedroom, just pull out your phone and you can have your favorite show on in a second. Of course, if you are already sitting in a Lazy Boy getting ready to watch Mad Men, wouldn't just using the remote control be easier? At the same time, we all know how remotes can disappear. Kids take them, or the dog runs off with it. Perhaps it gets lost for a week between the cushions of the couch and nobody thinks to look. This app solves that problem. 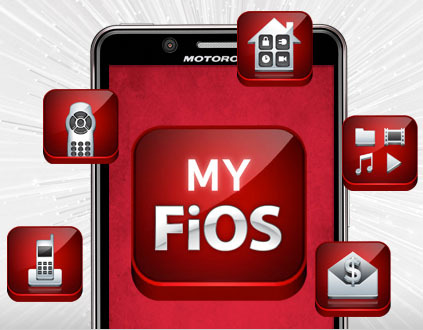 With Verizon FIOs On Demand, you can purchase, rent or watch movies on your phone. However, Verizon seems to know that most phones are too small to get the most out of viewing a film. Seriously, how can you enjoy HAL and the cinematography of Stanley Kubrick’s 2001: A Space Odyssey on a small screen, or get the most out of a big budget blockbuster? Don’t worry: the Verizon FIOS on Demand app lets you watch these movies on up to five authorized devices, including FIOS TV, online and PC. This app is practical, convenient and useful. You can use your phone to rent a movie on the way home from work, and then watch it on your 50-inch HD TV. Now that's living the good life. The Verizon FIOS DVR Manager enables you to schedule recordings on your DVR. You can schedule and record by either using a built-in guide, or by scrolling for a specific title. Any app that simplifies the recording process saves you time, and Verizon’s motto "You’re on the go. And so is your media" seems to define this application perfectly. Whether you waiting at an appointment or riding in the subway, the day is filled with small slots of time that can be further maximized. The Verizon FIOS On Demand and the DVR Manager applications take advantage of and utilize this idea. The Verizon Mobile Remote, on the other hand, seems like a novelty. It might be one of those apps you show at a cocktail party, but chances are you will seldom use it. Then again, who knows: Maybe the TV remote is your dog’s favorite chew toy?